The history of the development of the femtosecond (10-15 sec) laser systems is intense and exciting one. Due to the extremely short duration of the pulse, the peak power of modern commercially available laser can exceed 200 gigawatt. In comparison, the total power of power stations of Germany, including solar power plants, and wind power stations are expected to approach 120 GW by the year 2010. Application of femtosecond pulses allows the introduction of laser energy with unprecedented precision in space and time. By applying the light source that has the same timescale as molecular vibrations, one could observe and even control the outcome of chemical and biological reactions in a real time. The application of the femtosecond lasers to probe molecular dynamics has been explored for more than two decades now and it was recognised by the award of the Chemistry Nobel Prize in 1999. The probability of n-photon absorption is proportional to the nth power of the photon flux density, consequently high photon flux densities are required in order to observe this phenomenon. Multi-photon absorption was demonstrated with the help of lasers, since the intensities much higher than provided by other light sources could be achieved. It was demonstrated that an atom can absorb two or more photons simultaneously, thus allowing electron transition to the states that can not be reached with a single photon absorption. Two-photon absorption (TPA) is mediated by a virtual state which has an extremely short lifetime (several femtoseconds). Thus, TPA is only possible if a second photon is absorbed before the decay of this virtual state. Note that excited energy levels S1 and S2, shown below are not exactly the same, since the selection rules for single photon and two-photon absorption are different. The main advantages of multi-photon microscopy are high spatial resolution and the ability to selectively excite specific molecules. The two-photon polymerization (2PP) technique is based on the interaction of femtosecond laser radiation which induces a highly localised chemical reaction leading to polymerization of the photosensitive material with current resolution down to 100 nm. Stereolithography, which is a rapid 3D prototyping process, and the 2PP technology are based on a similar mechanism - light triggers a chemical reaction, leading to polymerization of a photosensitive material. Polymerization is a process in which monomers or weakly cross-linked polymers (liquid or solid) interconnect and form three-dimensional network of highly cross-linked polymer (solid). Photoinitiators - molecules which have low photo dissociation energy - are often added in order to increase the material photosensitivity. Absorption of a photon leading to a bond cleavage (photo dissociation) and formation of highly reactive radicals is illustrated below. 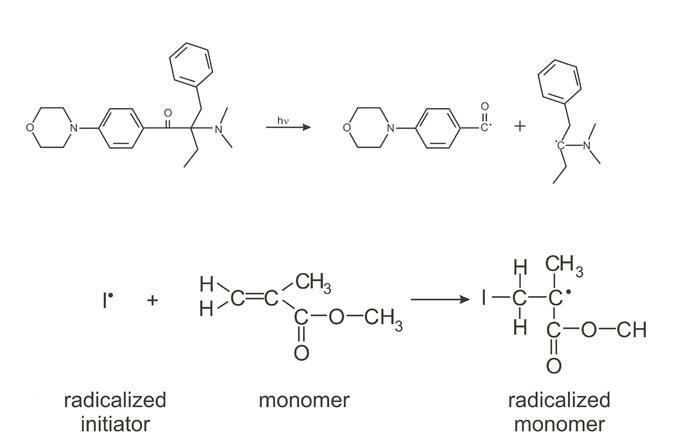 Absorption of a UV photon breaks C-C bond and results in the formation of two radicals, which react with the monomer, e.g. methyl methacrylate, and initiate radical polymerization. The reaction is terminated when two radicals react with each other. In stereolithography, a UV laser, applied to scan the surface of the photosensitive material, is producing 2D patterns of polymerized material. The UV laser radiation induces photopolymerization through single photon absorption at the surface of the material. Therefore, with stereolithography it is only possible to fabricate 3D structures using a layer-by-layer approach. Since photosensitive materials are usually transparent in the infrared and highly absorptive in the UV range, one can initiate two-photon polymerization with IR laser pulses within the small volume of the material by precisely focused near-infrared femtosecond laser pulses. Figure below provides a simplified illustration of the difference between single photon and two-photon activated processing. A material is polymerized along the trace of the moving laser focus, thus enabling fabrication of any desired polymeric 3D pattern by direct “recording” into the volume of photosensitive material. In a subsequent processing step the material, which was not exposed to the laser radiation, and therefore, stayed unpolymerized, is removed and the fabricated structure is revealed. The material sensitive in the UV range (λUV) can be polymerized by irradiation with the infra-red light of approximately double wavelength (λIR=2λUV), under the condition that the intensity of the radiation is high enough to initiate two-photon absorption. 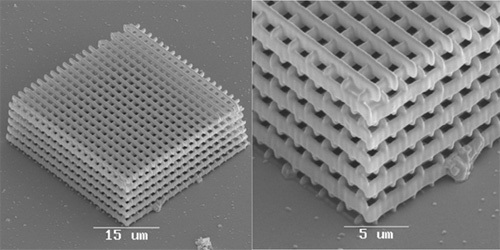 One of the first and the most thoroughly studied applications of 2PP technique is the fabrication of 3D photonic crystals. A photonic crystal is an artificial structure exhibiting periodic variation of dielectric constant of material. Such structure has a similar effect on propagation of photons as the periodic variation of electric potential in regular crystals on propagating electrons, hence the name - photonic crystal. As a result, a photonic bandgap - a frequency range, for which the propagation of photons in a certain direction is forbidden, occurs. In a 3D photonic crystal, the refractive index changes periodically in any given direction. Devices based on photonic crystals allow tailoring propagation of light in a desired manner. Many fascinating physical phenomena occur in such structures: control of spontaneous emission, sharp bending of light, lossless guiding, zero-threshold lasing, trirefrigence. Futuristic prospects include not only applications in telecommunications as all-optical signal processing, but also “transistors” for light and optical computers. Artificial fabrication of a living tissue that will be able to integrate with the host tissue inside a body is a bold and challenging task undertaken by tissue engineering. Natural repair of a tissue at the particular site is a result of complex biological processes, which are currently the subject of intensive research and are not yet fully understood. In order to encourage cells to form tissue, one has to create an appropriate environment, exactly resembling that of a particular tissue type. Some cell types can preserve tissue-specific features in a 2D environment, while others require a 3D environment. One of the most popular approaches in tissue engineering is the use of 3D scaffolds whose function is to guide and support the cell proliferation in 3D. Advantage of 2PP for the fabrication of scaffolds is a combination of unprecedented resolution, high reproducibility confidence, and a possibility to fabricate true 3D structures. Transdermal drug delivery is a method that has experienced a rapid development in the past two decades, and has often shown improved efficiency over the other delivery routes. It avoids many issues associated with intravenous drug administration, including pain to the patient, trauma at the injection site, and difficulty in providing sustained release of pharmacologic agents. In addition, precise dosing, safety, and convenience are also addressed by transdermal drug delivery. The flexibility and high resolution of the 2PP technique allows rapid fabrication of microneedle arrays with various geometries suitable for in vivo use, and for the integration with the next generation MEMS- and NEMS-based drug delivery devices. This web page is an excerpt from the chapter "Two-photon polymerization - High Resolution 3D Laser Technology and its Applications " by Boris Chichkov in the book Nanoelectronics and Photonics: From Atoms to Materials, Devices and Architectures(with permission from the author and the Springer).